The Winter Olympics are here! 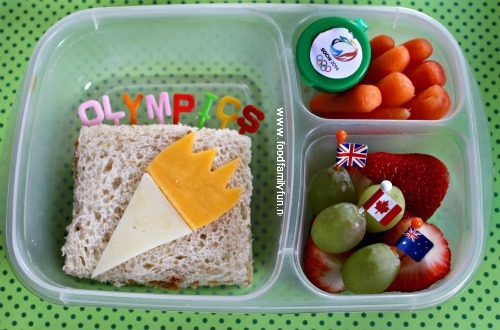 Here's a fun lunch that I made for myself in my Easy Lunchboxes to celebrate the start of the Olympics. provolone and cheddar torch shaped topper. and ended with strawberries and green grapes for something sweet. The Winter Olympics aren't big in Bermuda and we don't have many athletes that participate. I'll be cheering for all of the Commonwealth Athletes during these Olympics. This post is part of am Olympics Lunch themed blog hop. Please click the button below to hop on over to see what Eileen from Robot Squirrel and the Monkeys has made! Cute lunch! I love your cheese torch! So cute! I love the torch. The flame looks so great! This is so cute! I love the torch!